Alex offers 2 options to choose from when it comes to entertaining during the day of a wedding. The two options are Afternoon Drinks Reception Performance or Wedding Breakfast Performance. At some weddings the afternoon drinks reception can sometime be considered a ‘lull’ in the day. Often this is where you as newly weds will be whisked away for an hour or so for the stunning photographs that will help you relive the special day for the years to come however what happens for your guests at this stage? Often they will be enjoying the lovely drinks package you’ve provided whilst left to chat and entertain themselves. This is where having some live music and some interaction can really set the tone for the rest of day and help entertain your guests keeping spirits high for the festivities to follow. 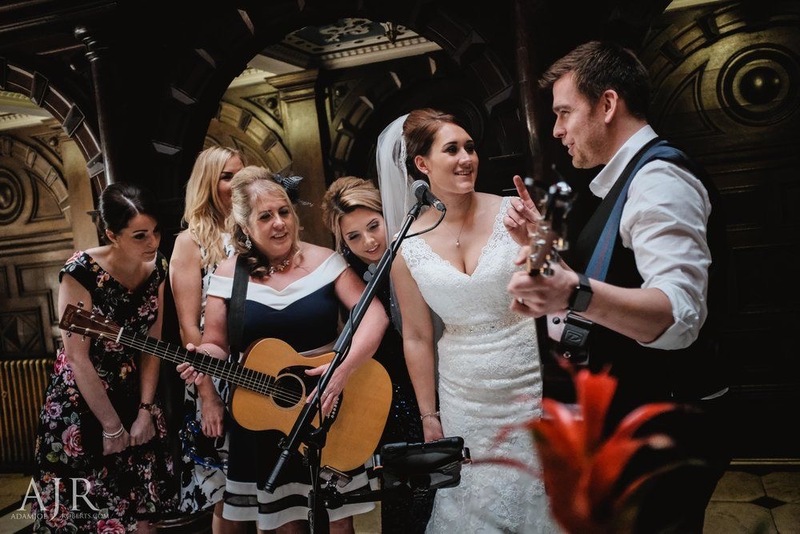 Alex can offer a laid back approach providing lovely listening music whilst welcoming requests from the guests or if you prefer to start the partying a little earlier can be much more interactive and get your guests joining in and singing along to all their favourite songs. Most couples request a combination of the 2 approaches asking Alex to ‘play it by ear’ starting off laid back and livening up the atmosphere should if feel right. 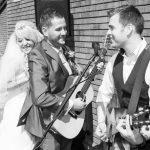 Often one of the huge talking points for the day and days to follow is when Alex will get either the bride or groom up to join him for song something which all the guests will love and come together for, and don’t worry it doesn’t necessarily mean singing if you don’t want to! Alex will perform for the whole duration of the Afternoon Drinks Reception up to a maximum of 2 hours. With this option Alex will also act as your Wedding Host, however if booked with the Bronze package this is only applicable if you choose for the speeches totake place before the wedding breakfast. Some of these ‘Real Wedding’ videos show Alex performing during the Afternoon Reception. Hatfield Wedding – This wedding a Longlands Hotel was a really party from the off. The wedding party getting involved really helped start the party before dinner was served. Odling Wedding – This was lovely wedding at Beeston Manor for a truly great couple. In the afternoon Lisa joined me to dedicate a special song to Ben which got all the guests going for the rest of the day. Notere Wedding – This wedding at Briars Hall was a fantastic day and here I got both Matt and Laura to join me which really helped create an amazing atmosphere for the rest of the day! If you would prefer live entertainment whilst you dine but don’t fancy having the more common ‘Crooner’ approach then this could be just for you. Alex will try to be non obtrusive to the proceedings of the wedding breakfast performing an array of laid back song arrangements whilst interacting with your guests in between courses should you wish. 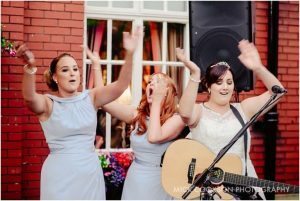 If you’d prefer more of a party during the wedding breakfast then that certainly something he can aim to provide whether it’s getting the whole wedding breakfast to sing along or even targeting the bridal party for impromptu guest appearances. With this option Alex is happy to act as your Wedding Host. Some of these ‘Real Wedding’ videos show Alex performing through the wedding breakfast. Nolan Wedding – This video was taken by one of the guests during this festival themed wedding where each table was named after a favourite artist of the couple. After the main course I perfomed for each artist representing a table and got the guests from that table to join in. This was the George Ezra table. Burke Wedding – This wedding was an exceptional example of careful planning and careful deliberation when choosing suppliers to fulfil their ideas. This video from Mike Roberts Wedding Films shows me performing through the wedding breakfast from around 7:38 in.